Love classic horror? If you do, then you are no stranger to the name H. P. Lovecraft or the creatures from the deepest dark that he has created – Cthulhu, Nyarlathotep, Yog-Sothoth – or a certain book “bound in human flesh, written in human blood”. Now during the Toronto Fringe Festival, Monkeyman Productions have gone to the trouble of resurrecting the Grandfather of Horror. In the tent space at the Fringe Club, Lovecraft himself appears to answer questions from his fans and followers, give advice on life and love, and indulge in a bit of poetry. 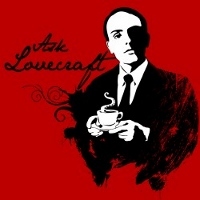 Ask Lovecraft is one of the six Alley Plays at the Toronto Fringe, a lovely half-hour bit of off-the-cuff theatre that is improvisational, smart and quite funny. Lovecraft is performed by Leeman Kessler as based on the ongoing YouTube series. It’s hard to say whether his impression of the man is accurate or not — considering Lovecraft himself has been dead for decades, but the character that Kessler has created is quite the audience pleaser with his infectious wit and sarcasm. The performance is created based on audience submitted questions making each performance different and therefore unscripted. From the show I attended, I learned that Lovecraft is a cat person (because if he’s going to pick up the feces of any of ‘man’s best friends’, it’d be that of a feline), his favorite colour is fuchsia (because it’s fun to say), and he’d much prefer if his devoted followers would simply leave cartons of ice cream at his grave rather than trying to wake him from eternal slumber on his birthday. If you find yourself wandering the Fringe Club, getting to know H. P. Lovecraft is a fantastic way to check out some great small-scale theatre aside from your standard tickets. Alley Plays are all PWYC (pay what you can) and worth the price of admission. Ask Lovecraft is an Alley Play playing at the Tent Space at the Fringe Club behind Honest Ed’s (581 Bloor Street West).